IMG_8624, originally uploaded by Mic2006. This section of the Wasteland waterway is past the blue barrel sink, it is where the cave air is now from well below the surface, camera lenses fog and the water is noticeably colder than what is coming from the surface. We were refering to the wide expanse before this as the cobble beach. Just beyond here a vadose trench cuts deeply into the floor and JC and I explored some short distance into the canyon. You can here rushing water somewhere up ahead so I wonder if this is water flowing in from the surface sinks along the forest edge, or if the downcutting is a result of a shaft somewhere on beyond. I believe that we should get some significant distance from this tunnel and it is standing height once in the trench. sheets of rock cut inward from either side and the trench winds erratically to either side. Crawling back was a lot harder than going forward. I struggled to keep the camera somewhat dry and finally it quit. When the batteries died I got the new batteries wet and then something went wrong inside. We will continue our exploration over the next few weeks. 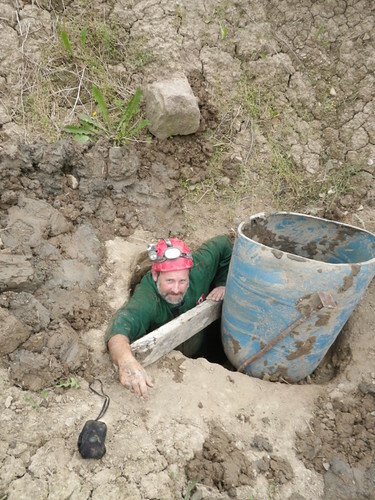 Today’s push in Wasteland Waterway, a new cave that JC and I recently discovered has thus far exceeded our best imaginings. 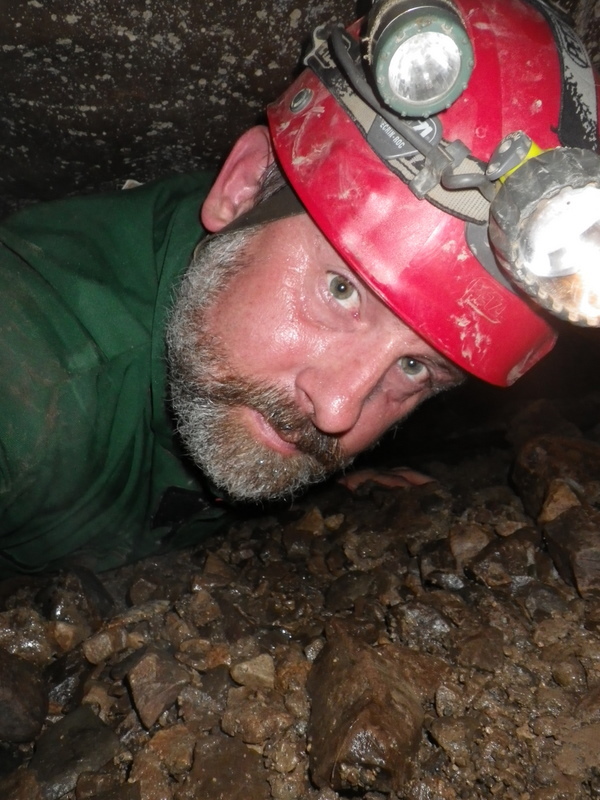 As you can see the entry crawl is wet and it gets wetter and more laborious as you go deeper in. We passed the blue barrel in the sink – our bailout route if the water level increases while we are in there. I must admit I began to suspect that it was rising as we were leaving. At times the roof is almost touching the water and you must pick your path to keep yourself in air. More pics and story to come. Though we were disappointed by the flooded entrance to Wasteland Waterway we decided to check a nearby sink and in hearing noise JC and I burrowed away and opened a karst window in the bottom of what looked like a meteor crater – the roar from within was encouraging. The picture above shows what my camera picked up, a vadose passage that had airspace and was sucking more from the hole through which we peered. as we left we packed the sticky soil over a framework of sticks to keep our tunnel safe till we return next week. 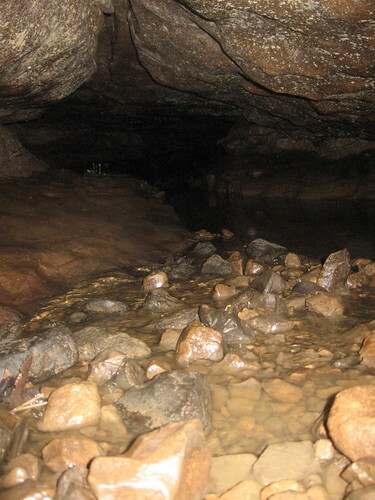 Hopefully the water will have dropped by then and we can push the cave. From the guy who bought you the book Rockwatching, stay posted for the release of my new book about 2-3 months from now on caving in Ontario it will feature some 38 good Ontario solution caves (some possibly unknown even to experienced local cavers), along with details of their exploration and formation, lots of pics (no locations). Check out my last book – Tamarindo; Crooked Times in Costa Rica here. 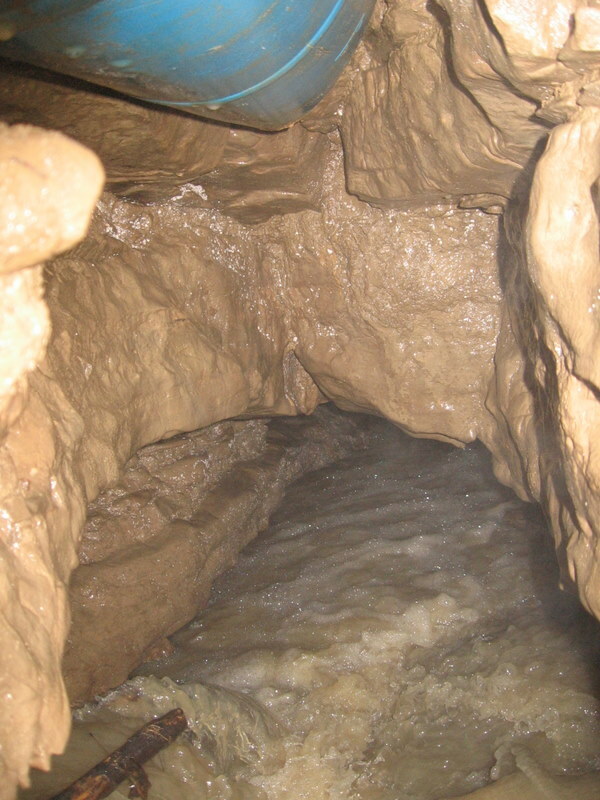 It rained all night last night so JC and I slogged through the marshy forest – clumps of gooey clay sticking to our boots, only to find the entrance to Wasteland Waterway completely submerged, though it was taking everything that was washed in to it there was no airspace for a caver. 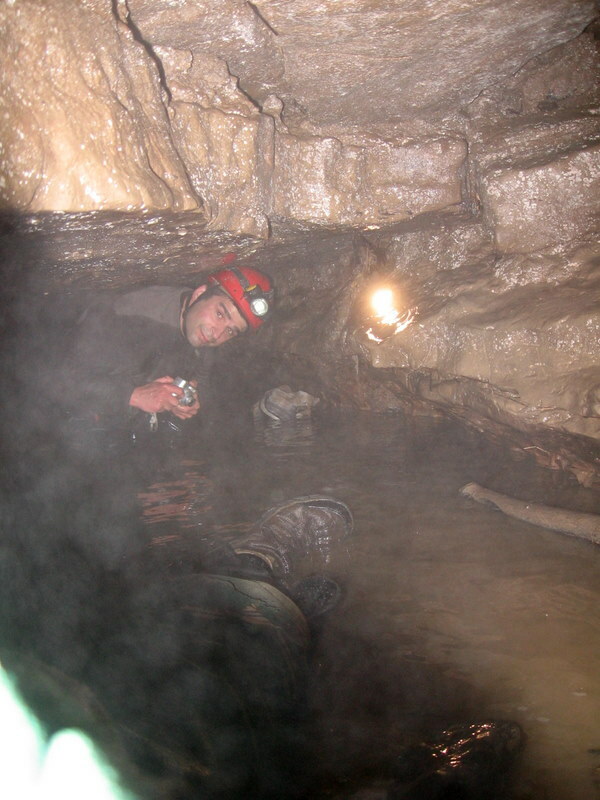 Important point – rainfall on clay surface above karst equals death trap for those who are caving down below.